Very sad to hear about the passing of Ravi Baswani. I met him in March last year in Mumbai, and at first glance he looked a bit sturdier than I’d expected; his two best-known roles - as Farooque Shaikh’s rascally bachelor pal Jai in Chashme Baddoor and as the high-strung photographer Sudhir in Jaane Bhi Do Yaaro - had fixed him in my mind as a wisp of a man permanently in danger of being blown away by a strong breeze, in the style of the great silent-screen comedians. 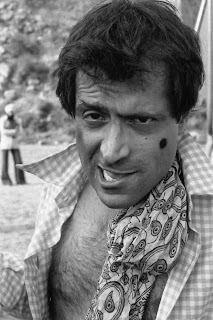 One of the best sight gags in Chashme Baddoor has him leaping nimbly to and fro in a single-minded effort to kick-start a scooter into life; it’s slapstick, but it’s also balletic and done with tremendous comic timing, and it’s my favourite Baswani memory. Watching it, you almost feel like the scooter will kick this little man back. Which is what happened. 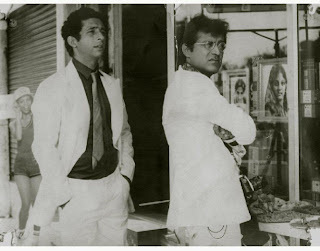 Naseeruddin Shah – whom Ravi knew through the Delhi theatre circuit – was getting ready to film Sai Paranjpye’s Sparsh and he happened to show Ravi the script. “I was so impressed that I told Naseer I have to be involved with this film, even if it meant working as his personal spotboy.” Eventually Paranjpye asked if he would handle Properties for the film, and Ravi and his theatre group (called “Non-Group”!) became closely involved with behind-the-scenes work. 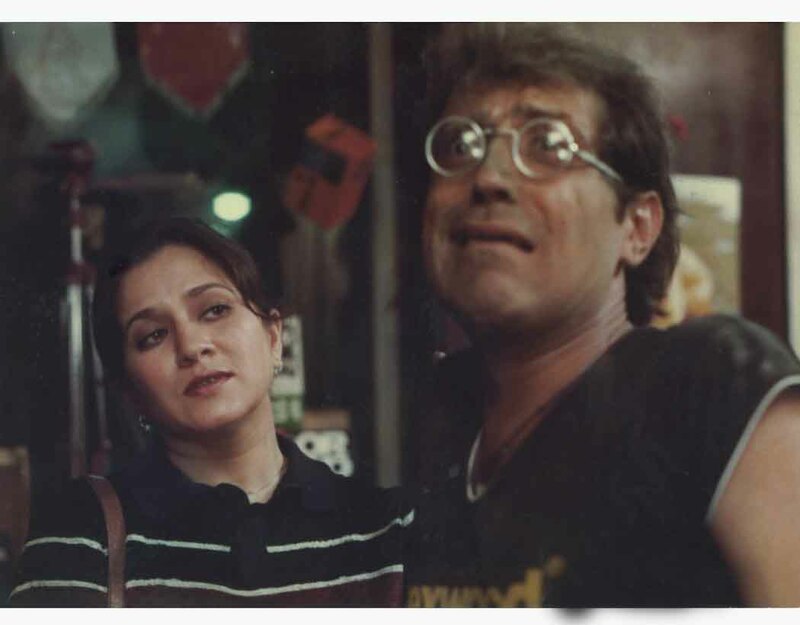 Paranjpye was so impressed (in an interview to Filmfare, she said “Thanks to Ravi Baswani and his team, if I asked for a pink elephant at night, it was there in the morning”) that she cast him in Chashme Baddoor. After the Bombay premiere of that film, he was going to return to Delhi to resume his theatre work when a friend asked him to direct and act in a play for him. 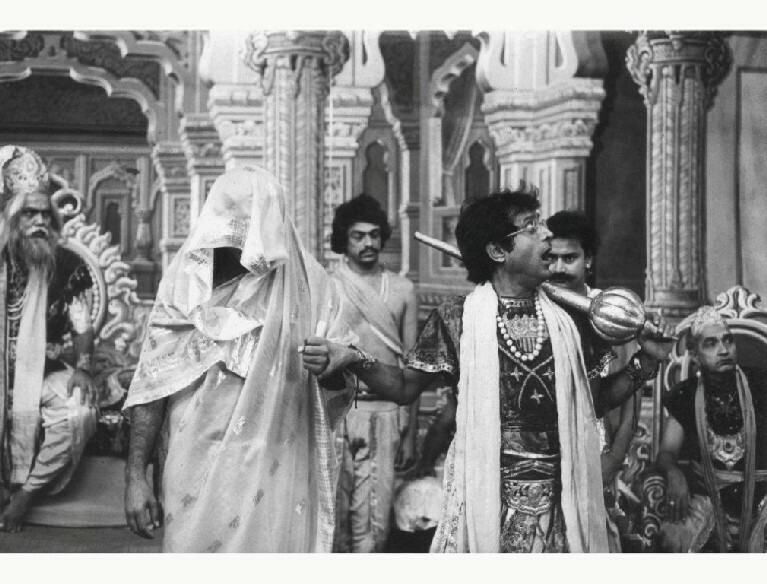 Kundan Shah, who had enjoyed Chashme Baddoor, attended one of the shows and was enthralled by Ravi’s talent for manic humour and by his glass eye, which gave him a mad-scientist look at times. He had already thought of Ravi for the role of the high-strung Sudhir, and this performance made up his mind. 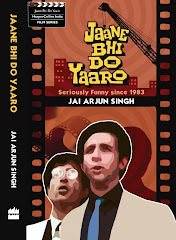 “To me, Ravi WAS Jaane bhi do Yaaro,” Kundan says today, “He was the comic cement of the film. When I got him on board, I knew that a key component had been taken care of.” Ravi would bring exactly the hoped-for qualities to the role. His Sudhir is hyper-excited, paranoid, marked by childlike swings of emotion: when he’s morose he is the picture of incurable pessimism, but a few seconds later he’s on his feet again, this time impractically cheery even when there isn’t much to be cheery about. In scenes such as the one where he yelps “Jaane nahin doonga!” at the rent-collector, he resembles nothing so much as a Chihuahua snapping away at someone’s heels. This makes him a perfect foil to his more poised, idealistic partner Vinod (played by Naseer). 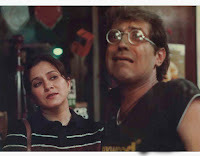 It also places the responsibility of pulling off the broader comic scenes on his shoulders – something that would carry a real-life resonance during the shooting, as Naseer became increasingly unconvinced about some of the comedy and Ravi occasionally had to mediate. A lovely writeup, Jai, thanks. You made him come alive again. Did you see him in "Yun hota to kya hota"? Such a different role, that was - maybe it took Naseer to cast him in a non-comic/manic role? It is very difficult to interview a person to the level that he really speaks about himself without a care. 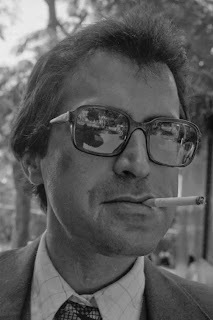 Though this is not the only interview on your blog which reaches this level, I am yet to come across a more befitting perspective on Ravi Baswani's life. The best thing I've read on Baswani, Jai. Thanks. Wonderful reading. Thanks for sharing, Jai! Good to see people remembering actors of the likes of Ravi Baswani. I'm sad for the loss of an actor of the caliber of Mr. Baswani, as he was supposed to launch his own film shortly as reported by Satish Shah his close friend to leading daily. 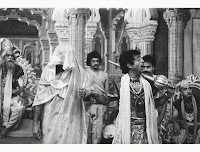 He brought about spontaneity to two of the most comic and true to life roles in Indian cinema. I did follow him when he switched to the small screen with "Just Mohabbat" a coming of age drama which was aired on Sony in the late 90's, post his forgettable itsy bitsy roles in a host of films. In “Just Mohabbat “, he played a senior eccentric, a caricaturish character. Uncle to the protagonist, but was thoroughly enjoyable. His swansong was of course the latest “Mirinda” ad with Asin which is on air. Also remember him in Idhar Udhar - a somewhat zany piece of TV (though eclipsed by Yeh Jo Hai Zindagi and the like) with the Pathak sisters. We pretty much used to watch it just for Ratna Pathak and him. Thanks for sharing very useful.